Kudou Shinichi was a bit of an odd-ball high school student who loved mysteries and acting as a high school detective; much like the Hardy boys if you will. He loved Sir Arthur Conan Doyle, and indeed like Sherlock Holmes, pursued soccer as a means of relaxation; as Holmes did with fencing. (Unlike Holmes however, Shinichi is rather tone deaf). Unfortunately, as his fame grew, so did his enemies, until when out on a date with a good female friend (but not yet actually going steady with), he crossed paths with the "Men in Black" (the Kurozukume). Clearly, these people had much to hide and so, the great high school detective decided to follow them and investigate. While spying on the Kurozukume, he failed to notice one more henchman in hiding, and as a result was apprehended. Not having much time to deal with the interloping Kudou, the Kurozukume decided to feed him the poison APTX (apo-toxin) 4869. This toxin ended up changing Shinichi's body, reducing his body back to that of an elementary school child. Because of his greatly changed appearance, and in order to protect those whom he cared for, Kudou Shinichi was forced to change his identity to Edogawa Conan; Conan in honor of Sir Arthur Conan Doyle, author and creator of Sherlock Holmes. With the appearance of a six year old, Conan can no longer live on his own in his house and as such is staying with his (Kudou's) girlfriend, who is unaware of his true identity, and her detective father. Few people know Conan's secret, for if those who had wreaked the change on Shinichi ever found out that he was still alive, they would return and try to finish the job. Likewise, they would not hesitate to harm Shinichi's loved ones either. 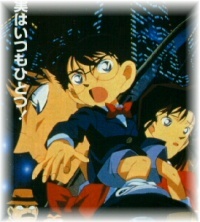 However, while few and far between, Conan has a few friends in the know including: Agasa Hiroshi, a scientist who helps Conan by making him new gadgets, and also by helping create Conan's new identity, Hattori Heiji - a rival high school detective, and Haibara Ai - one of the members of the Kurozukume who, in order to escape from the gang was also forced to take APTX 4869. Ai's older sister was also a member of the kurozukume however, she was killed by her fellow henchmen when she refused to hand over a large sum of money which had been stolen in a previous heist. Parental Guidance Advised - Many scenes involving death, violence or blood due to murder or other crimes. There are also many scenes of Mouri Kogorou striking Conan.